For more than 80 years, Oil-Rite® has been manufacturing high quality lubrication equipment. We design and manufacture all kinds of lubrication system components, including dispensers, valves, switches, and lubrication pumps. As an ISO 9001:2008 certified company, you can count on us to deliver the highest quality lubrication products and equipment. Come see why we have earned a reputation for quality and service! Contact us today and visit our website! A lubrication pump is the component of a lubrication system that is responsible for moving lubricant from a reservoir into the other components of the system. This is a very important part of any lubrication system as it keeps new lubricant flowing through the system, which allows the system to run smoothly. Lubricants can be pumped in many different ways. Depending on the intended applications and the type of system you are using, certain types of pumps may work better than others. It is also important to consider the type of lubrication you plan to use. Transfer pumps, grease pumps, air-operated pumps, diaphragm pumps, and oil pumps are just a few different kinds of lubrication pumps. A transfer pump is really any pump which is used to move a liquid from one location to another, so many lubrication pumps could be considered transfer pumps. 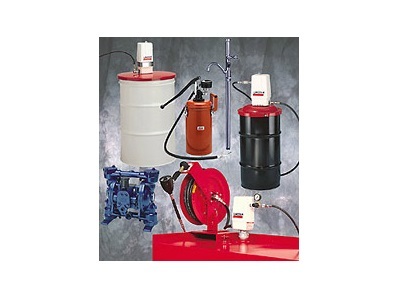 Air-operated pumps are a more unique set of lubrication pumps which utilize compressed air to drive the pumping action. Grease pumps and oils pumps are two other more specialized pumps which are designed and built to pump more specific types of lubricants. For many industries, an automated lubrication system can improve efficiency drastically, eliminating the need to manually lubricate machinery and other tools. As essential components of any automated lubrication system, lubrication pumps are, therefore, utilized in a multitude of industries. Oil pumps, for example, are utilized in the automotive, construction, agriculture, and transportation industries to help lubricate engines and motor components. The energy, food, beverage, printing, and many other industries also utilize lubrication systems and pumps.